There's something undeniably uplifting about Pride. Universal critical praise and comparisons to The Full Monty and Brassed Off have seemed to pre-empt the film's box office success even before it's out on general release, but it's not merely the fact that it's a working class underdog story. This is the kind of film that makes you go away wanting to tell other people to see it, because for the most part, it's a bloody riot. Stephen Beresford's script takes place in 1984 and follows the true story of the formation of Lesbians and Gays Support the Miners, (LGSM) a group of young activists who notice that the striking miners are now enduring a similar kind of police brutality to which they've become accustomed. Led by the irrepressible Mark, the group treks to the Welsh mining village of Onllwyn to throw their support behind the locals and help them through the bleak midwinter inflicted by Margaret Thatcher's government. After the tepid hagiography of The Iron Lady, we were due a film like Pride and it's all the more gratifying that it's not just a po-faced retort. Phyllida Lloyd's film only looked more monumental for trying to humanise its central figure with a misguided dementia subplot, while reducing her opponents and detractors to cartoon misogynists or stock footage. On the contrary, Beresford and director Matthew Warchus find more than just humanity here. Instead, they mine an endless reserve of good humour and elevate the story on high. The script also keeps a remarkable number of plates spinning at once. The film starts out with Joe, played by George Mackay, a closeted young man who still lives with his parents in Bromley when he finds compatriots on a gay pride march in the city. Without ever losing sight of his tumultuous journey throughout the film, Warchus manages to build and pay off a ton of other character arcs from there on out. Somehow, it never feels crammed- conflicts and differences arise between characters throughout, but it's a film in which the similarities between two groups on the same side become apparent more quickly than the characters even realise. There is a clear generational gap in the cast, which actually benefits the film enormously. Stars like Bill Nighy, Imelda Staunton and Paddy Considine may top the bill, but they're effectively holding up the springboard for new talent amongst the less familiar cast of LGSM. Young'uns like MacKay and Joseph Gilgun continue their rise to stardom here, but there are revelatory and erstwhile turns from Ben Schnetzer and Faye Marsay. Nighy et al are excellent as a matter of course, but watching the young cast is like looking into the future of British cinema. Everybody ups everyone else's game and anyone in this film who isn't already a star, is almost certainly going to be. As clichéd as it may be to say so, this is one of those films that makes you laugh and makes you cry, with neither detracting from the remarkable togetherness of its tone. The couple played by Andrew Scott and Dominic West form a good example of the equilibrium- West is incredibly charismatic as an extroverted luvvy, while Scott outwardly has more conflict to face. We see different sides of each of them as the film progresses and they're just two out of a huge cast of completely rounded characters. It's never wry or arch and it only really comes up short when it takes on an aspect of gay culture in the 1980s to which there is no funny answer. 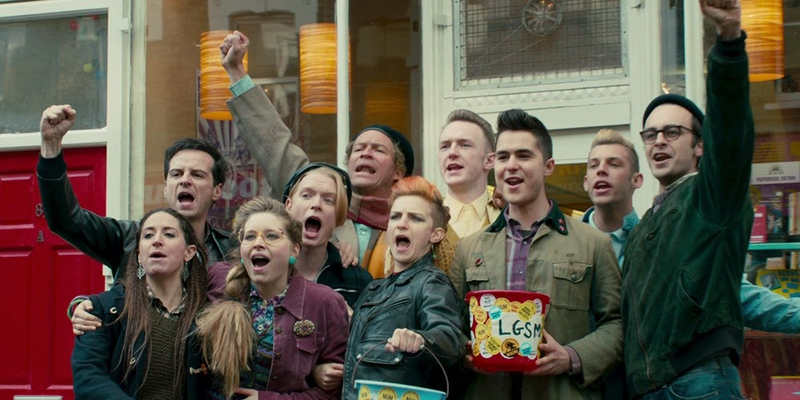 Pride isn't a film that is completely free of the usual issues that are often clumsily countenanced in films about LGBT characters, but it has a can-do attitude in its representation of a social evil that brought two very different groups together as one. It's impeccably well acted by the diverse cast and it's a very broadly feel-good film that's all the more powerful for its pathos; Beresford and Warchus acknowledge the true story's darker, more bittersweet side throughout, hitting all of the dramatic beats bang-on, while never forsaking the rapturous sense of humour. Pride is now showing at cinemas nationwide. 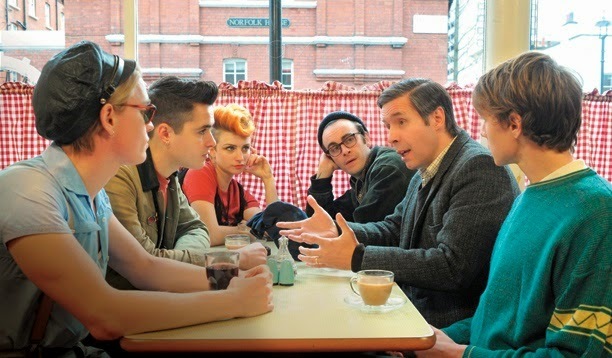 If you've seen Pride, why not share your comments below? If not, be sure to take along a Bill Nighy Bingo card when you do- between awkward pausing, snorty laughing and bloody brilliance, you'll get at least a line.